With Asia set to become the world’s largest wealth market – perhaps as early as 2014 – it is essential that wealth managers in the region prioritise local knowledge in their value propositions. The forward momentum of the emerging and mature Asian markets means that the region looks set to become the world’s largest wealth market, and this could happen as early as next year. The findings of this year’s Asia Pacific report from CapGemini and RBC Wealth Management mark a tipping point for the global wealth management industry. The message is clear: the time to develop tailored solutions for Asia is now. 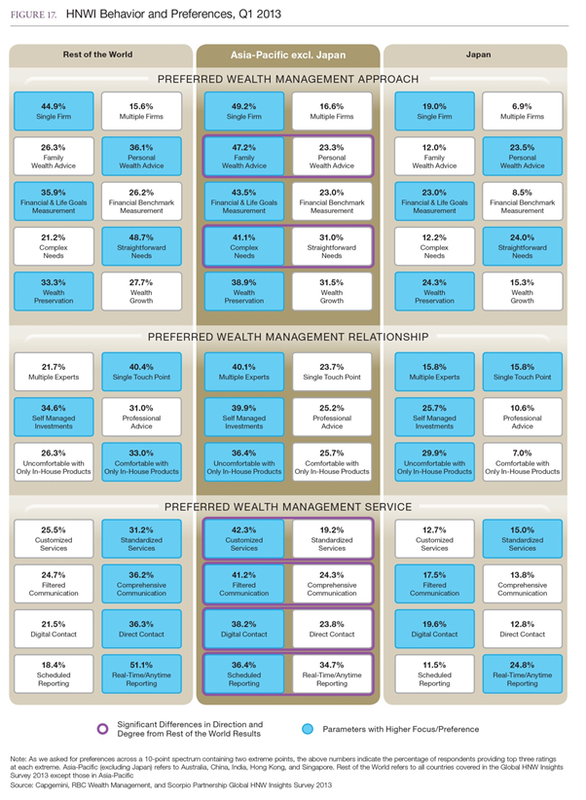 Indeed, within the report, the CapGemini, RBC Wealth Management and Scorpio Partnership Global HNW Insights Survey 2013 highlights strong client preferences that could become the hallmarks of a future Asia Pacific wealth management value proposition 1. When compared to the rest of the world, Asia’s HNW clients (excluding Japan) tend to identify their wealth management needs as complex. They are more likely to be goal-oriented than benchmark oriented and seek advice relating to their family’s wealth needs. To meet their financial goals, their preferred approach is to access multiple experts from within a single firm with a high level of digital interaction. They want customised services; they are uncomfortable with in-house products; and they want communications that are filtered and reports that are scheduled. In other words, Asia’s HNWIs are highly demanding, and as a client group they could well push the wealth management model to its limits. On a positive note, however, the research also finds that Asia’s HNWIs are more willing to pay for customised wealth management services than HNWIs in the rest of the world. All this strongly suggests that future innovation for the global wealth business could well be pioneered in Asia. Whether or not the Asia Pacific region tops the global wealth charts next year, we will be keeping a close eye on developments in the region to see if wealth management firms respond positively to their clients’ cues. The findings are based on research with 1,400 HNWIs across six markets in Asia: Australia, China, Hong Kong, India, Japan and Singapore, which formed part of the wider Global HNW Insights Survey 2013 of 4,400 HNWIs across 21 major wealth markets in North America, Latin America, Europe, Asia Pacific, Middle East and Africa.